Not exactly solid proof of anything, but that's some interesting stats nonetheless. This game is looking to have my favorite art style of any Zelda game though. Don't mean to rock the boat (see what I did there?) but Wind Waker to me was the most disappointing of Zelda games. And aside from the cell shading I see little similarity. Hope it stays that way too. Sorry for the controversy. Carry on! My second favorite game of all time. I wasn't making any similarities to Wind Waker though, just saying I'm as hyped as when WW was first announced. That chart above me, if you shimmy past Bleck, says it all. 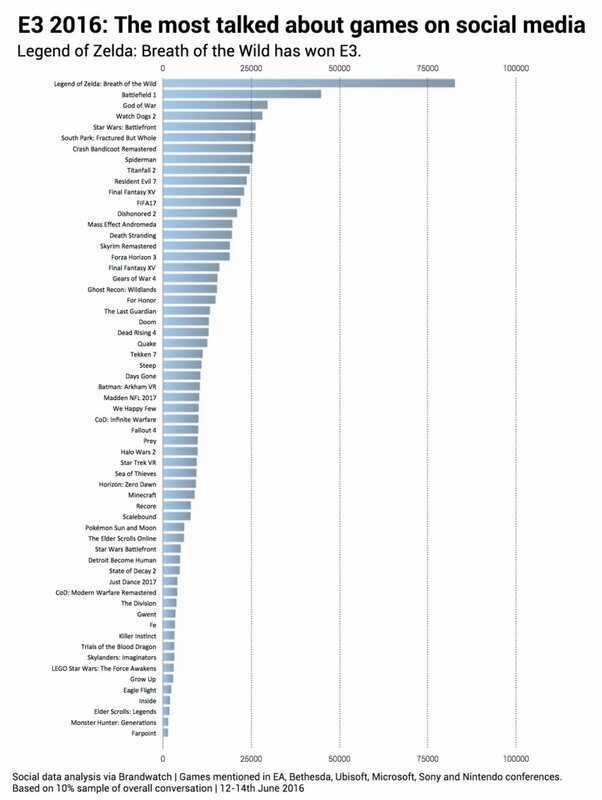 Why is Star Wars Battlefront on that chart twice? ....That's nuts...Well, Zelda won this year, I guess. Sure. there are Koroks, but the Temple of Time is still standing. in TP, all that was left was some stairs, support columns and the pedestal. But in BotW, it's still standing, but not exactly inhabitiable. Also, that old guy said that Hyrule had been in decline for a while. 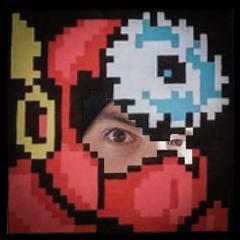 Maybe the three timelines merged? It looks like a western fantasy/exploration RPG set in Hyrule. ... and I'm totally fine with all of that. Brandwatch unable to merge "Star Wars Battlefront" with "Star Wars: Battlefront". Breath of the Wild is the only game to come out of E3 so far that seems unique and different. Most of the rest is either an in-place iteration of an existing franchise, a remaster, largely unknown, or disappointing so far. Also, it's Zelda, one of the biggest names in gaming. Also, Nintendo sank an awful lot of money into hype for it, with by far the largest amount of floor space devoted to a single game, a ton of press, and a lot of gameplay demonstration. They've also been really hush-hush about it so far, and just unleashed a huge amount of info. So, not surprising. I don't think the old man looks much like Ganondorf at all. If he's someone we know, it's almost certainly the King of Hyrule. But he could just be a new take on the generic old man from Zelda 1. The Master Sword in BotW is in its original pedestal. That's not where it ended up at the end of WW, and it would be strange for it to be replaced unless there's an intermediate story that hasn't been told yet. The Koroks' plan in WW seems to be to plant trees to fight global warming and lower the sea level. That would take an exceptionally long time, more than 100 years, but it could work. There's an item called Rock Salt in BotW. Apparently its description suggests it came from a dried-up sea, but I haven't been able to find the exact text yet. Edit: Found it: "Crystallized salt from the ancient sea commonly used to season meals." Not as explicit as people have been claiming. The Sheikah seem to be incredibly ancient in the Zelda timeline. Their artifacts are old even in Skyward Sword. Why did we never see all this stuff before? Did all these buried shrines get exposed recently? It's true that the Calamity Ganon seems to be more of a force than a creature. They may be using "Ganon" to refer to any nonhuman incarnation of Ganondorf. It also might be a mistranslation--anyone know what it's being called in Japanese? It might be more literally "The Ganon Calamity", which would be something he caused rather than something he is. It's sort of a cloud--could it be related to the Wind Sorcerer Vaati? Skyward Sword contained a time travel element of its own. If time travel in Ocarina of Time could create fragmented timelines, so could the one in Skyward Sword. This could then be a completely unexplored timeline branching from then. But that wouldn't really explain the run-down Temple of Time. Same. Also-I'M SO HUNGRY I COULD COOK AN OCTOROCK. I CAN'T WAIT TO COOK SOME DOGONGOS. MY BOI-THIS IS WHAT COOKS STRIVE FOR. We need these quotes in the game. Seriously. What quotes? There are no games that have those lines of dialog in them. Such things do not exist. What? An invitation to Lake Laogai? I am honored to accept his invitation. You realize your first and second ideas are incompatble, right? Wind Waker takes place many generations after Skyward Sword. That would mean the Era of Chaos, the Era of Prosperity, the Force Era (Minish Cap, Four Swords), the Hyrule Unification war (Ocarina of Time, ending in Link's adulthood), the flood, the events of Wind Waker and Phantom Hourglass, and the recession of the waters all take place over only 100 years. Bear in mind also that between Ocarina of Time and Wind Waker, enough time ("generations") had passed for the Hero of Time to have become an ancient legend, and for prayers for his return to have gone unanswered for a long time. Can't squeeze many generations into less than 100 years even without all that other stuff. OK... So I seem to remember in WW part of the story references a time when Ganon rose but a hero didn't arise to face him. Could it be that this is that time, and possibly link is doomed to fail? Perhaps Link in his weakness can't actually defeat Ganon and is forced to Flood Hyrule instead? (Possible pre-emptive spoiler right there) Or maybe, it's some mid-state post-apocalyptic era before the world's flooded, but after Ganon's done his thang, and the Hero has awoken too late? Anyone remember the details behind the early version of the first Zelda game? Originally, it was going to be set in the future, and the Tri-Force was actually a series of circuit boards/microchips. Some other sci-fi elements here and there. Look it up if you don't believe me. Seeing all the glowy magic-tech stuff in this game makes me think of that. This is the modern alpha-build of the first game. IIRC the Wind Waker says the hero didn't even show up so this wouldn't be possible. There wasn't a hero who failed, there was simply no hero. People on the internet noted that the Rock Salt item Mirby mentioned was found in a mountain which is a weird place for it to be... unless it used to be part of the ocean. But... but... the histories may have been incorrect. Well that's me told then. You win this round, adversary. But I shall return! 4K res screencaps from Nintendo. I'd suggest opening each one in it's own tab. 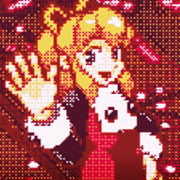 The main gallery only lets you look at it in a lower magnification when you click on it, so it isn't doing the images justice. There's a lot of speculation running along the line that this game comes after Wind Waker. Not surprising, really, since there's a fair bit of circumstantial evidence supporting it. But let's back up a bit. 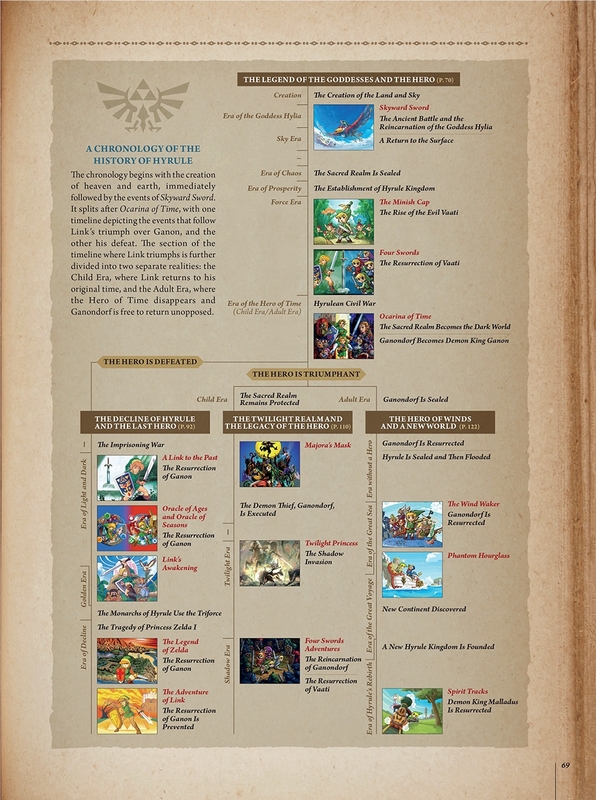 There's three timelines splitting from Ocarina of Time: One where Link stops Ganondorf as a child, leading to Majora's Mask and Twilight Princess, one where Link defeats Ganon as a child and seals Ganondorf away, leading to Wind Waker, and one where Link is defeated by Ganon, leading to A Link to the Past and, notably, the original Zelda and Zelda 2. Notice something? Following Ocarina of Time, Ganondorf returns in the timelines of Twilight Princess and Wind Waker, while it is -Ganon- that returns in the timeline of A Link to the Past and the original Zelda and Zelda 2 because Link was defeated after Ganondorf transformed into Ganon. Ganon is, as far as I'm aware, never mentioned in the Twilight Princess and Wind Waker timelines since Ganon either never existed or never made an impact as Ganon in those two timelines where he is defeated. The flip side is that Ganondorf is never mentioned as Ganondorf in the A Link to the Past timeline, since his impact is most notable in history as Ganon. And now here we are with this new game, where -Ganon- is mentioned, not Ganondorf. This would suggest that this game is in the A Link to the Past timeline, as the name "Ganon" should not be known in the other two timelines unless something drastic happened that we're not privy to yet. In addition, the current final games in the A Link to the Past timeline are the original Zelda and Zelda 2, which fall into the Era of Decline, referring to the Kingdom of Hyrule if I recall correctly. Considering that, from what we've seen of this new game, Hyrule is now virtually gone; this may suggest that this game comes after those original games. 1. "What about the Koroks?" — The Koroks are the Kokiri from Ocarina of Time, and they reverted to their Korok states in Wind Waker due to the state of the world. Kokiri are also mentioned in other games, I believe. It wouldn't be unreasonable to assume that the same reversion happens at some point in the other timelines; perhaps they revert when a strong society or something around them ceases to exist (for instance, Hyrule). 2. "What about the rock salt in the mountain?" — Perhaps another Great Flood happened in the LttP timeline. Or perhaps new mountains were lifted up somehow, bringing low-lying, previously underwater ground up with it – this game appears to have more mountains in it than I remember existing in Hyrule previously. Regardless, there are ways for it to find its way up there. It's good evidence for being after Wind Waker, but it is far from conclusive. Anyway, that's it for my thoughts at the moment. I would actually like to point out that Ganondorf in Wind Waker is mainly referred to as "Ganon", including by the King of Red Lions when he first shows up and in the first few forms of the game's final boss ("Puppet Ganon"). That said, with how many people seem to be reminded of how Zelda 1 started, it wouldn't surprise me if it was in the same timeline as Zelda 1, or at least is channeling the hell out of it in terms of the game's feel (perhaps this is the start of a new series?). Personally I'd like to hope that it's in the Wind Waker timeline, but that's just because I love Wind Waker. Noted. Really, for as much as I loved Wind Waker, I should have remembered those instances. Still, the correlation is there for my hypothesis, I think. 'Ganon' could be the moniker used by the people for any ill-defined, sufficiently large evil they encounter. As I mentioned before, the name Ganon is primarily used to refer to him in his monster form, and what better way to describe a huge unknown force of evil than to call it a monster? So it could be that the name of Ganon has become the name for great evils in whatever timeline this falls into, due to the fact that, in at least the Wind Waker and the LttP timelines, Ganon does make an appearance and could have made a lasting impression on both timelines' histories (moreso in the LttP timeline, obviously). That the King of Red Lions refers to Ganon as such in the Wind Waker timeline lends some credibility to the idea, I think. For some reason, part of me kept reading it as "Breath of the Wind". I was ALWAYS thinking it was breath of the wind, damn son. I'm not sure about the breath of the wild. Having lived near a ranch in the past, not good marketing image for me. Anyways, seems like Zelda has taken the trend with resource gathering. I like open world and survival games. Nintendo has got that golden touch with games, so I am looking forward to this.